The Western Conference Finals began on Sunday, May 27th, in San Antonio. The Spurs took on the Thunder, and if Game 1 is any indication, this is definitely a match-up worth watching. The Spurs ultimately pulled off the 101-98 victory behind Manu Ginobili’s 11 points in the fourth quarter, and 26 points overall. In addition, Tony Parker had 18 points and six assists, and Tim Duncan had 16 points and 11 rebounds. The Spurs extended their history-matching winning streak to 19 (tied with the 2001 Lakers) with this Game 1 victory. If the Spurs can pull off a Game 2 victory on Tuesday, they would break the record for longest winning streak that has extended into the playoffs. The Spurs are now 9-0 in the 2012 playoffs, and they truly have been playing flawless basketball recently. Gregg Popovich told his team recently, “I want some nasty!” The Spurs have followed through on this request by playing aggressive, gritty, and passionate basketball, and this was on perfect display in Game 1. 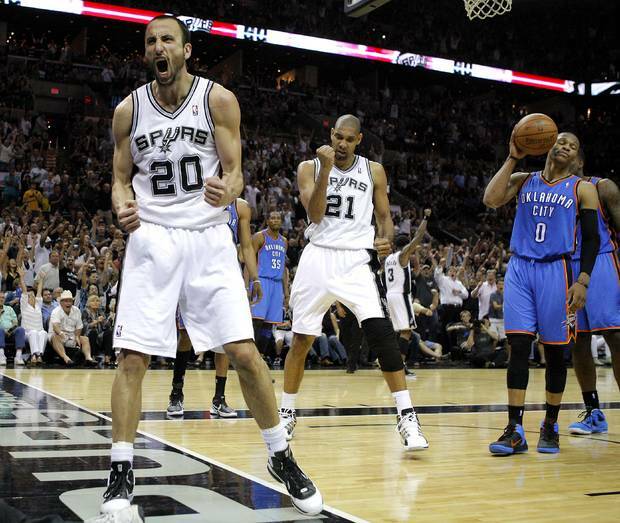 As perfect as the Spurs looked, the Oklahoma City Thunder played a strong game as well. Kevin Durant had 27 points and 10 rebounds, Russell Westbrook had 17 points and five assists, and James Harden had 19 points, however, nine of those points came in the last, meaningless minutes of the game. The Thunder played lock-down defense throughout three quarters, but they weren’t able to stop the surging Spurs in the fourth quarter. This will be a competitive series, but the more experienced Spurs are playing too flawlessly to lose this series. SERIES PREDICTION: Spurs win in 6. The Eastern Conference Finals started on Monday, May 28th, in Miami. The Heat took on the Celtics in their first game match-up and like many of the Heat’s games, LeBron James took over. James had 32 points and 13 rebounds and Dwyane Wade had 22 points and seven assists to lead the Heat to a 93-79 victory. The Heat didn’t receive much help from any other players, but their two leading scorers were enough to stop the aging, injured Celtics. 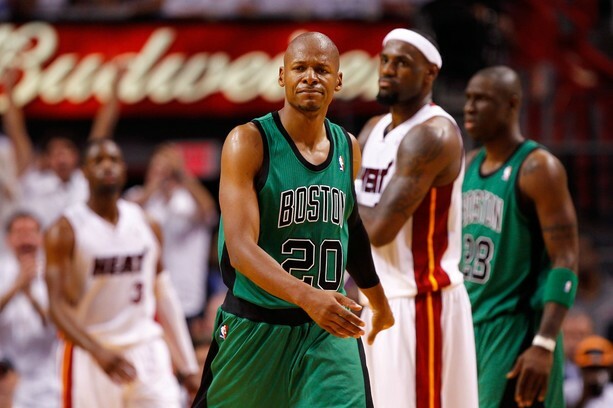 With Avery Bradley out the rest of the season because of shoulder surgery and Ray Allen limping along with ankle/foot problems, the Celtics need to find some answers to the fast-paced game of the Heat. Ever since the Celtics moved Kevin Garnett over to the center position, he has flourished. In Game 1, he had 23 points and 10 rebounds while shooting 56% from the field. Rajon Rondo had a decent game, with 16 points and seven assists, but the other members of the Big Four struggled as Paul Pierce only had 12 points on 28% shooting and Ray Allen only had 6 points on 14% shooting. The Celtics received barely any bench production, and this must change if they want to win this series. The Celtics have disproved many people in the playoffs so far, but it seems as if they will simply run out of steam during this series. SERIES PREDICTION: Heat win in 6. The Warriors are moving to San Francisco for the 2017-2018 season. 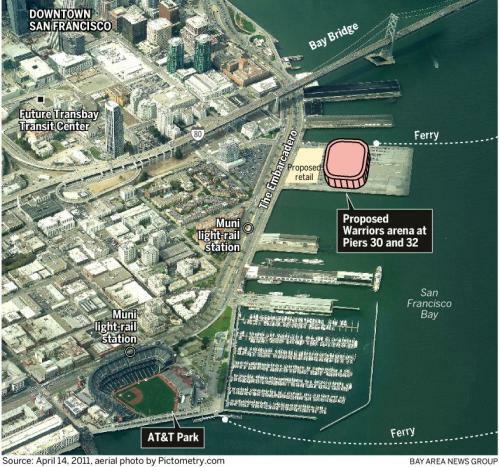 The Warriors’ lease with Oracle Arena in Oakland ends after the 2016-2017 season, so the Warriors’ new arena will be on Pier 30/32, south of the Bay Bridge and between the Ferry Building and AT&T Park. The Warriors held a press conference yesterday morning at Pier 30/32 to show the beauty of the location and the excitement of those involved. Ahmad Rashad, sportscaster for NBC Sports, hosted the press conference and introduced all the speakers, which included: San Francisco Mayor Edwin Lee, Warriors co-owner Joe Lacob, Warriors co-owner Peter Guber, Warriors president and COO Rick Welts, NBA commissioner David Stern, Warriors executive board member Jerry West, former Mayor of San Francisco Gavin Newsom, President and CEO of the San Francisco Travel Association Joe D’Allesandro, Warriors head coach Mark Jackson, and Warriors starting power forward David Lee. 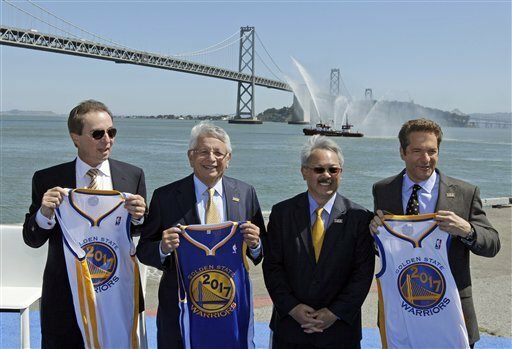 Ever since Joe Lacob and Peter Guber bought the Warriors a couple years ago, it’s been clear that the new ownership group would move the Warriors to San Francisco at some point. Oracle Arena is currently the oldest arena in the NBA, opening in 1966. Oracle went through renovations during the 1996-1997 season, but the Warriors needed a new arena and San Francisco was the best possible location. The City of San Francisco will provide the land to the Warriors, who will then have to pay to repair the piers, which will cost roughly $75 to $100 million. This new arena will create thousands of jobs for residents all over the Bay Area and will generate millions of dollars in tax revenue and economic growth for the City of San Francisco. The new arena will be privately funded, and will be a multi-use arena for not just basketball, but also for other concerts, conventions, cultural events, etc. Supposedly, only about 1,000 parking spots are currently available on Pier 30/32, so a parking structure might have to be built as well. If not, the arena is in a prime location for fans to take public transportation such as the Golden Gate Ferry, Muni, Bart, etc. Some fans are hoping that this move to San Francisco will lure more free agents to the Warriors because San Francisco is a more desirable location than Oakland. However, this is simply not the case. Once the Warriors start consistently winning and making the playoffs, then free agents will be more compelled to play here. Location isn’t as important as some people think, as some top-tier players are in smaller markets, such as Kevin Durant and Russell Westbrook of the Oklahoma City Thunder. About half of Warriors fans seemed to be pleased with the move, and half seem to be frustrated. I believe that this is an excellent move for the Warriors organization, for the City of San Francisco, and for the fans, most importantly. The Warriors will have a state-of-the-art arena, and fans will have a much more enjoyable experience overall. Although the majority of attention on the Warriors is now on 2017, it is important for Warriors fans to stay in the present. This is definitely exciting news for Warriors fans, but Mark Jackson stressed the importance of supporting the team now and that winning is still their focus, for now and once they move to San Francisco. Hopefully the Giants will respond to this attention by winning consistently this upcoming season. Now that the first round of the playoffs is over, the conference semifinals are just underway and this round should prove to be quite an interesting round of the playoffs. 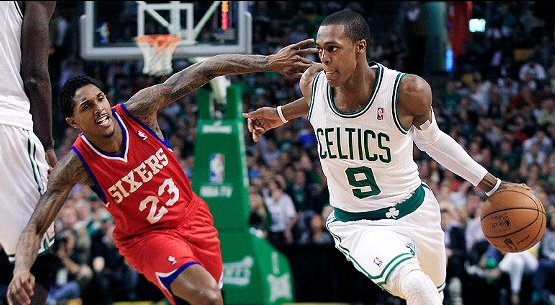 The Celtics beat the Sixers 92-91 in the first conference semifinals matchup on May 12th. Rajon Rondo had his eighth career playoff triple double with 13 points, 17 assists, and 12 rebounds. Kevin Garnett also chipped in 29 points and 11 rebounds. This might be the “last run” for the Celtics with their aging core continuously being riddled with injuries and criticism. However, with Rondo competing at the high level that he’s playing at, the Celtics can be very hard to beat. With Ray Allen back coming back from injury and Avery Bradley finding his role on his team, it seems as if the Celtics can find a way to pull out this series. 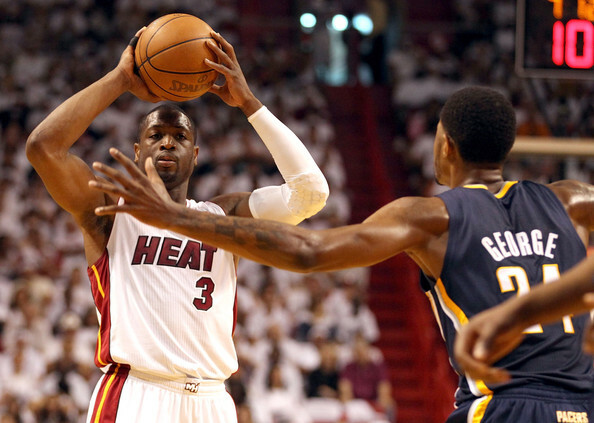 The Heat beat the Pacers on May 13th 95-86 in the first game of their conference semifinal matchup. LeBron James had 32 points and 15 rebounds, and Dwyane Wade had 29 points. Chris Bosh suffered an abdominal strain during the first half of the game, and he’s been ruled out indefinitely. This is a major blow to the Heat, but it will not cost them the series. The Pacers are an underrated team, but they will not be able to stop all the momentum that the Heat have. 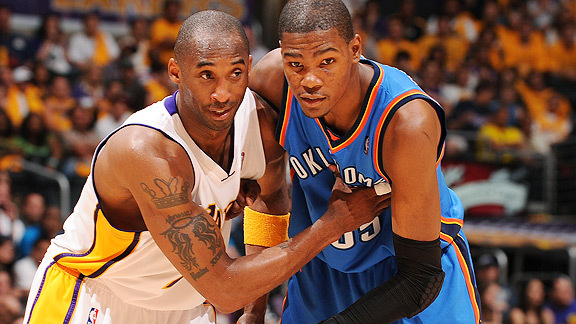 The Oklahoma City Thunder and the Lakers play the first game of their series later today, May 14th, and this series is expected to be a dramatic one. The last time these two teams faced each other, Metta World Peace elbowed James Harden so hard that Harden got a concussion. World Peace was suspended seven games, and his first game back was in Game 7 of the Denver series. This is bound to be a physical, emotional series. Even though the Thunder are a young team, they are still the more well-rounded team, and they will ultimately win the series. 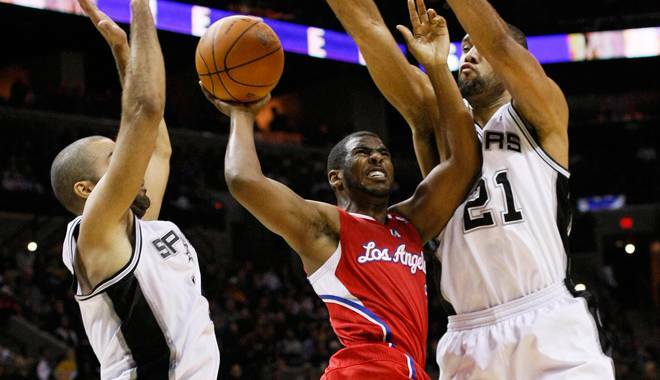 The San Antonio Spurs take on the Clippers tomorrow night, May 15th. The Clippers are coming off a seven-game series against the Memphis Grizzlies, and the Spurs are coming off a sweep of the Utah Jazz. It could be said that the Spurs are also on their “last run,” but the experience and veteran leadership that this team has is invaluable. Chris Paul is the best point guard in the league, but he will not be able to lead this team to a victorious series. The San Francisco Giants play the second game of a three-game series tonight against the Los Angeles Dodgers, and it’s fairly safe to say that the Giants played some of their worst baseball of the season yesterday. The Giants were completely stifled last night by opposing pitcher Ted Lilly, and, ultimately, they lost 9-1. 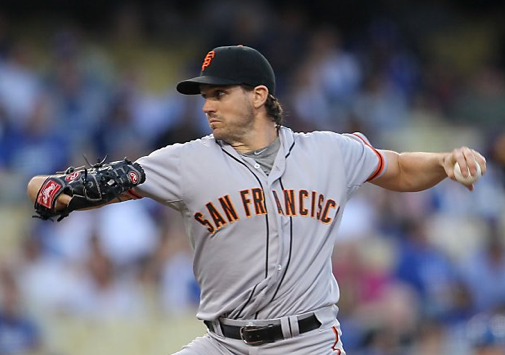 Barry Zito kept them in the game for six innings, while only giving up three runs (one unearned), but the Giants could not find any consistent offense. Watch an error by Gillaspie here. Watch an error by Edlefsen here. Before the game, the Giants also had to deal with one of their relievers being suspended for 100 games due to performance-enhancing drugs. Guillermo Mota tested positive for clenbuterol, which is a drug found in inhalers that can be a stimulant and can build up muscle mass. This is ironic because Mota has a 5.06 ERA this season and has been pretty much ineffective all season. Mota is serving 100 games this season because this is his second drug offense. He was suspended for using performance-enhancing drugs for 50 games when he played for the Mets, which he served in 2007. 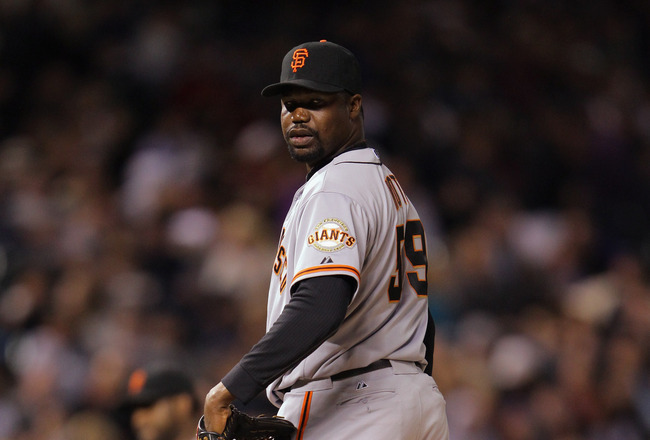 This recent suspension does leave the Giants in a little bit of trouble seeing as Mota was their only long reliever on the roster. 1) Why would Mota even be using children’s cough medicine? 2) Mota would have had to take such a large dosage that normal cough medicine would make more sense to take. 3) Based on that argument, all other players that have used cough medicine before could’ve gotten a positive test too, and they haven’t. Therefore, this argument as to why Mota’s suspension should be appealed is totally bogus and makes no sense at all. The Giants are in quite a tumultuous situation right now because of the injuries that they have to deal with and their poor play. This Dodgers series is going to prove to be quite difficult for the Giants since they have to face Clayton Kershaw tonight, who they normally have very little luck against, and Billingsley tomorrow. Hopefully the Giants can start playing tighter defense, hit for a better average with runners in scoring position, and gain some momentum going into the next series.